This simply styled wire pull is ideal for todays modern and contemporary home. 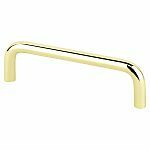 Its polished brass finish compliments a wide variety of cabinetry for both residential and commercial applications. Note: This product is also known as 6051303P, BQ6051303P on other websites.